This industrial style cocktail table will bring life to your living room. 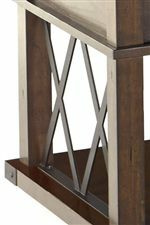 The warm, ash-finished table top mimics planked wood while X-shaped metal decorations give the piece a touch of Tuscan style. 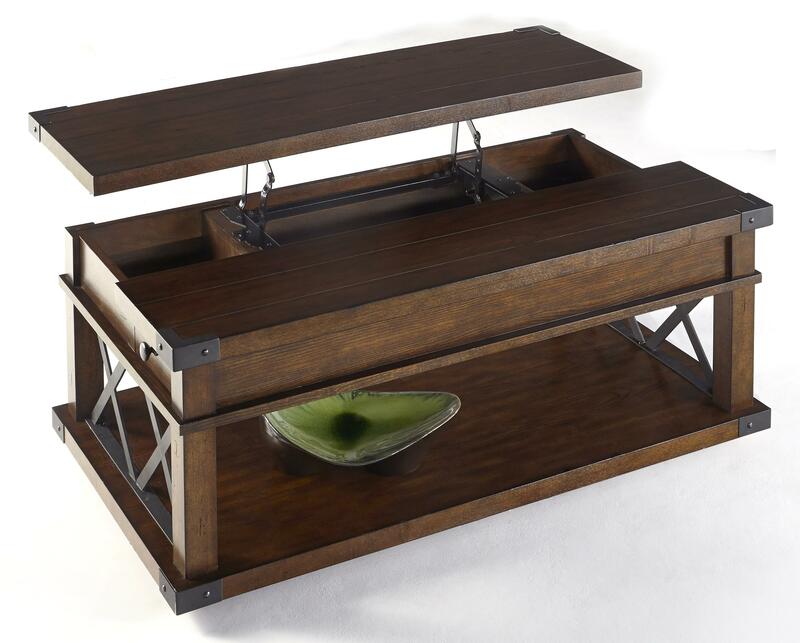 One bottom shelf gives you a place to display decorative sculptures or vases, and two side drawers give you a discreet place to store things like remotes and decks of cards. 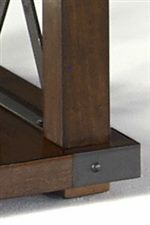 The Landmark Industrial Castered Lift-Top Cocktail Table with X-Shaped Metal Motifs by Progressive Furniture at Lindy's Furniture Company in the Hickory, Connelly Springs, Morganton, Lenoir area. Product availability may vary. Contact us for the most current availability on this product. Enhance your living room with the warmth of this Tuscan style collection of occasional tables. Cool metal accents and hardware complement the charming dark ash finish and add a touch of edgy, industrial artistry. Table tops mimic planked wood while X-shaped metal motifs decorate the sides. Each piece has a flat base, slightly raised on block feet, that double as a shelf to display decorative vases, photo albums and other treasured items. The Landmark collection is a great option if you are looking for Industrial Casual furniture in the Hickory, Connelly Springs, Morganton, Lenoir area. Browse other items in the Landmark collection from Lindy's Furniture Company in the Hickory, Connelly Springs, Morganton, Lenoir area.